The Vlamis team at BIWA SummitLast week saw several of us in Redwood Shores, CA at Oracle’s World Headquarters for the 2014 BIWA Summit. BIWA (Business Intelligence Warehousing and Analytics) is the special interest group (SIG) of IOUG that focuses specifically on the analytic options to the database such as Oracle Advanced Analytics including Oracle Data Mining and Oracle R Enterprise, Oracle Spatial and Graph, and Oracle OLAP and also on the various business intelligence offerings from Oracle including OBIEE, Essbase, Endeca, and more. 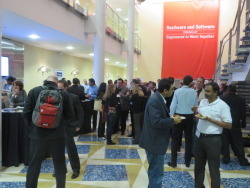 Vlamis Software Solutions was *very* involved in the conference. Dan served as co-conference chair and hosted many of the general sessions, Cathye Pendley was also on the conference committee and did yeoman’s work on several aspects of the conference including registration and the promotional email marketing campaign (Cathye was recognized by receiving the annual John Haydu Award for Outstanding Contribution to BIWA for all her contributions and effort), Jon Clark organized and managed the computing environment for all of the hands-on labs at BIWA, and I delivered several presentations and hands-on labs. The keynote presentation from James Taylor (author of Smart (Enough) Systems) was a highlight of the conference. James focused on how decision support and evidence-based analysis formed the foundation of best practices among leading firms and organizations. A clear fan of business rules, predictive analytics, decision support systems, strongly encouraged everyone to “begin with the decision in mind” and to leverage the power of modern systems for operational decision making. Social HourBalaji Yelamanchili, Senior Vice President of Oracle and the head of the Business Intelligence Product Development, kept everyone in their seats Wednesday evening (and away from the beer) by addressing the future of Oracle BI by showing off several new (yet to be released) versions of the product line in live demos (handled ably by Chris Lynskey). Lots of interesting new data visualization and interaction features are in the offing including BI Ask (a semantic search capability), BI Analyzer (new UI), and Mobile App Designer (already released, but lots of new capabilities). Suffice it say that Oracle is investing heavily in the future of its business intelligence line up. Philippe Lions gave a fast-paced and engaging view of Sample App V309 and the integration of Oracle Advanced Analytics and in-data base analytics with OBIEE 11g. I followed the demo along on my laptop on our own instance so that I could soak up as much detail as I possibly could. SampleApp remains as a tremendous resource for technical tricks and methodologies for getting the maximum out of OBIEE. Below is a list of the sessions in which we were involved. We feel very lucky to associated with such a tremendous event. Be sure to mark your calendars for the week of January 26, 2015 for next year’s conference. Thanks to everyone for attending, contributing, participating, and making this year’s conference such a success. I recently participated in Stewart Bryson and Kevin McGinley's "Real Time BI" Episode 15" video podcast. The first installment of this has been uploaded to YouTube and as an iTunes podcast. Stewart, Kevin, Tony Heljula from Peak Indicators and I discuss our thoughts from Oracle OpenWorld, including thoughts on the announcement of Oracle's in-memory database option, columnar storage and OLAP. Also, what does this say about Exalytics and its relationship to Exadata? While you're at it, check out my Tim Vlamis's and my Third Annual OpenWorld 2013 Unauthorized BI and Analytics Scoop Session recap of Oracle OpenWorld, presented as a BIWA TechCast a few weeks ago on our Papers and Presentations web page. We have updated all of our existing test drives and added a new one. We now use SampleApp v309 for our BI Test Drives, with even more sample dashboards and analyses. We work closely with the SampleApp team. Also check out their web page and YouTube channel. In addition, all three OBIEE test drives (OBIEE, BI Publisher and MapViews) are now running using the newest version of OBIEE, 11.1.1.7.1, and with a much quicker start-up. Register now to try it for yourself. Our Excel Analysis of OLAP Data Test Drive has also received an upgrade. It now runs using Simba 4.0. Our Oracle R Enterprise test drive is brand new! Try it out to try Oracle R.
The AWS platform is not only used as an environment for the test drive program. We also use it as the environment for all of our training classes, and also for client proof of concept projects. Private instances are available to clients through Vlamis. Contact Kim Drottz at 816-781-2880 x114 or at kdrottz@vlamis.com for more information. All of these are available at www.vlamis.com/testdrive-registration. Each one has a one to two hour exercise that you can go through, but you're free to go "off road" and explore on your own. Where else can you get your very own dedicated instance of Oracle software for free for up to five hours? Please let us know if you end up featuring this as well.